Ahhh, that time of year when berries are actually in season! Strawberries taste like what a sweet, sugary red ruby of a berry should taste like. Blueberries burst in your mouth with the juiciness that melts into wine on the side of your tongue. And in plain simple words, they are spectacular. There are so many things to do with these two beauties of berries. Often I like to simple toss them, strawberries sliced, with some coconut sugar and rose water. Eaten plain-lovely and simple. Eaten over yogurt-a decadent breakfast made for a queen (!). Eaten with blood orange sorbet-WHAT?! Delicious. And then there is, of course, strawberry shortcake. Classic and comfy. Strawberry pie (secret about me-I very much dislike any sort of fruit pie. Why eat a pie if there isn’t chocolate in it? ), an american staple. Strawberry sundaes, milkshakes, strawberries sliced, strawberries over cereal….etc. 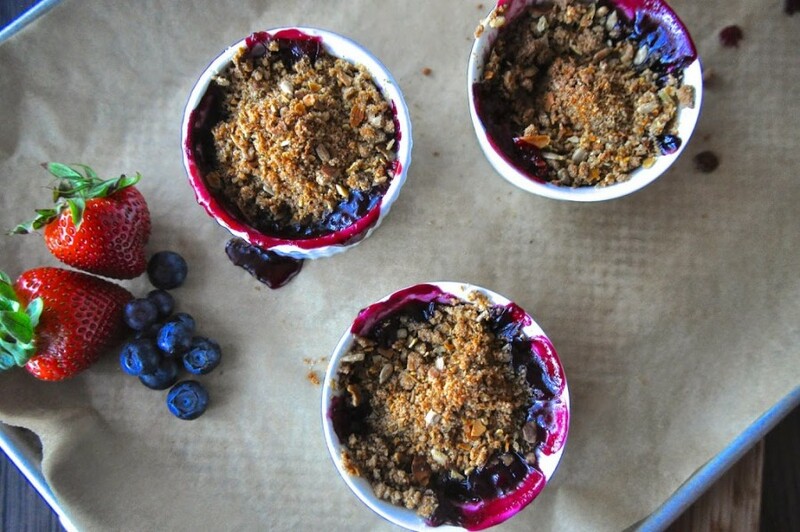 But one of my favorite ways is to make a crumble. A crispy, nutty, crunchy topping filled covering a beautiful bubbling mixture of fruit, sugar and lemon juice. In this case sliced strawberries and big, juicy blueberries tossed with coconut sugar, cardamom, lemon juice and a smidge of tapioca starch. When joined together and then baked their juices create this lovely sauce of that just extra “berri-ness”. Not super sweet, not super tart. There is just enough sugar to make the berries sing and just enough crunchy, buttery crumble topping to make you feel just a tiny bit guilty. But go ahead, make yourself feel a smidge more guilty and throw some vanilla gelato or coconut milk ice cream on there. Trust me, it’s worth it. happy eating is the best type of eating! 1. Preheat oven to 350. Line a rimmed baking sheet with parchment paper and place 6 1-cup ramekins on top. Set aside. 2. Put all the topping ingredients in a bowl and mix together with a pastry blender, the back of a fork or your hands. Mix until the butter and coconut oil is evenly mixed through and the mixture feels a little sandy. 3. In another small bowl mix together the berry filling along with ½ c. of the crumble mixture, gently tossing until everything is coated with the sugar. 4. 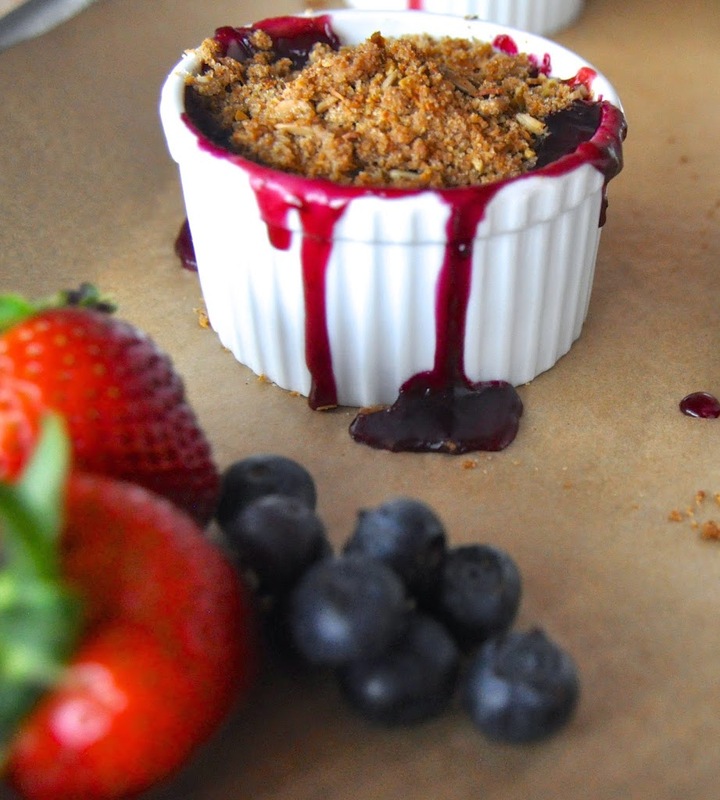 Pour the berry mixture evenly into the 6 ramekins and top with ¼ c. of the crisp topping. 5. Bake for 25-30 minutes until the berry juices are bubbling and the crisp is just lightly browned on top. Cool 10 minutes and then serve warm!